People think of many things when you say “cloud” and it’s a complicated question, not as straightforward as it seems. There are many characteristics of the cloud that are trade-offs. Different businesses rank the characteristics of the cloud in different ways. There’s a continuum of attributes in any cloud solution, and you need to map those to your non-functional business requirements, to pick the solution you want. 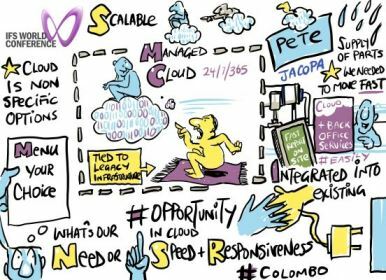 Now why are so many companies moving to the cloud? There are as many answers as there are companies. There are skills needed – what happens if you have a single DBA and they go off sick? What if you move from 8/5 to 24/7? Can you scale your resources to match that? Responding to changes is hard. What happens if you win a new contract or acquire a new company and you double the number of users? Maybe it’s about keeping pace with change. It’s hard to keep your business system up-to-date with the latest software. It’s hard to keep your devices up to date the with pace of change. We’ve designed a product which meets the needs of most IFS Applications users. It’s a fully managed system. We’ll upgrade and manage it for you, you just need to think how you use it. It’s a single tenant system in a multi-tenant environment. It can integrate with other systems and be customized. It’s supported 24/7 and sits on the IFS Cloud on Microsoft Azure platform, allowing you the benefits of all Microsoft’s investment. It’s managed in Orlando in the same place R&D live, which means we have lines of communication other solutions don’t. You have a single point of entry to IFS services – the customer portal. Jacopa is a 20-month old MBO of a company made up of some 100-year-old brands in UK wastewater management. We build, maintain and repair water treatment plants. Our MBO left us with no IT – we had a 9-month transitional arrangement with the old company but that was it. Forming a new company for 80-odd people is a pretty busy thing for the first few weeks, so it was nearly a month before we looked at the issue of an enterprise resource planning (ERP) system. We looked at what we thought we would need: functionality (BOMs, project management, warehouse, parts sales and reporting flexibility), Scalability (both user count and location) and a cloud-based solution. There are a lot of solutions out there but we could eliminate many of them quickly because they weren’t up to scratch. We only had a few months to do something people will spend two to three years on, so we did a beauty parade. IFS Managed Cloud did what we needed; it looked easier to configure and we liked the look of IFS Applications 9. 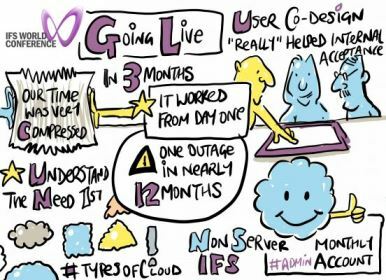 Why IFS Managed Cloud? We don’t have an IT resource. We have no desire to build an IT resource. We’re good at what we do, but it’s not IT, so let’s give it to someone who is. We wanted something that was easy for us – something delivered with a minimum of fuss. We decided in July. We needed to be live by mid-November. We have a small tea of consultants to help and train users, and we used an IFS partner: Anthesis. Yes, the speed of the project created some issues. It took a month to set up the cloud, which is 30% of our implementation time. Towards the end, it was barely organized chaos. And we didn’t really have time for a fully-tested solution before we went live. It’s easy to get caught up in the details of implementation and miss that it worked from day one. I had numbers from the start, we got good user acceptance. Users don’t care if it’s in the cloud or not, as long as it works. People don’t care as long as it works. They’ve had one major issue – a network outage, which was a configuration issue. They are down for much of a working day. If it happened again, they’d be back up in 20 minutes. And the helpdesk is sometimes a little slow in resolving application issues. With IFS Managed Cloud, the back office is all done for us. That’s a huge benefit for an organization with only a tiny bit of IT expertise. We got what we wanted – a fully-managed, end to end solution. We knew exactly what we needed, which made our time to implement feasible. Don’t get greedy – add “nice to have” features in later phases. Give people a decent, tight timescale, otherwise, your implementation will take too long. Get a small group of expert users together to lead the project, but backfill their roles so they have the space to do it. Make sure everyone is pulling in the right direction – there might be some politics around outsourcing the cloud. And great internal and external project managers are vital.